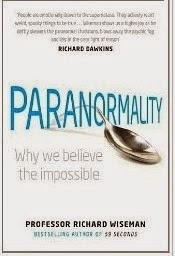 The subtitle here is ‘Why we believe the impossible’ or ‘Why we see what isn’t there’ (depending on your edition) emphasising that this a book not so much on parapsychology – the study of paranormal capabilities of the mind – but what you might call metaparapsychology – the study of why human beings incorrectly think that they have paranormal capabilities of the mind. This is a very entertaining, lightly written book that takes a storytelling approach to introducing some of the strange and wonderful claims that people have made for supernatural mental abilities, only to pull them apart. We begin with that most dubious of paranormal topics, psychics, with a UK psychic roundly failing in controlled tests and another psychic admitting exactly how he used cold reading tricks to fool his clients. Many books have debunked cold reading, but I don’t think I’ve ever seen before such a clear list of the six key techniques with a demonstration of how they were used in a specific reading. It’s superb. Next under the microscope are out of body experiences (and for some reason the spurious idea of a body losing weight on death), which prove rather dull, and then moving things with the mind. There is interesting material on a specific case, though I found the ‘five psychological principles’ that make people believe this kind of act a touch heavy handed after we’d already been through the six for cold reading, especially as by the time we get to the fifth there is not one, but two asides in the middle of explaining it. Next up is the table shifting/rapping/Ouija board style of spirit medium. There’s some nice historical introduction with the Fox sisters (who made ‘raps’ by clicking their toes) and some practical guidance on the do-it-yourself use of involuntary movement effects to jiggle tables or spell out Ouija messages (with perhaps a bit of cheating thrown in). We then move swiftly on to some entertaining ghost hunting tales (and thoughts on why we imagine ghosts exist), mind control and future gazing. All very readable, entertaining and often enlightening. Although as a whole I liked the book, there was something about it that put me off a little (otherwise it might have made 5 stars). It was a touch gimmicky – I’m not sure, for instance, I particularly liked the used of QR codes to direct the reader to find out more online. In principle this should be a good thing, but these 3D barcodes were so large and obtrusive that they ruined the look of the page every time they were introduced. However, that’s just a personal thing – I think many people would like this kind of messing about in format, so it shouldn’t count against what I think is a really interesting book on a topic that isn’t really called metaparapsychology, but ought to be. If psychics, ESP and the world of the paranormal interest you, this book is an essential balance to your library – and if you are a sceptic, it will give you plenty of chances to raise an eyebrow and have a chuckle at the gullibility of the rest of the world. * The usual choice is apparently a circle in a triangle or a triangle in a circle. I went for a triangle in a square.